It's interesting to hear the enormous Drum player of the Bruges carillon in action. I've often quipped that these historic drums (and some not-so-historic drums) often sound like a young child trying to play the piano (jerky rhythm, not all notes in a chord sounding together). Still, shouldn't a just-renovated drum system sound better than this? When a Flemish bell-company lays its hands on the largest, most sophisticated and most famous carillon playing mechanism in the Low Countries, but apparently doesn't even make the effort of getting aquainted with the basic laws of mechanics, then we have arrived back in the dark period of the carillon culture. That the city authorities don't have these sounds of drunkards halted immediately, says it all. In this way, the carillon art in Bruges is being displayed as a joke, it is a grotesque discordance. 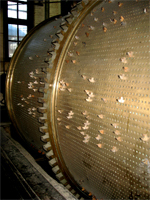 What is so special about the drum mechanism of the Bruges carillon? Its formidable size, refinement, it has been designed and constructed as a piece of art (by Jan de Hont, citizen of Hilvarenbeek). There's no question it has worked brilliantly in its early days. Imagine that, every 7.5 minutes day and night, great pieces of carillon music, performed fully automatically by such an amazing machine, it must have been considered a miracle. Today it performs miraculously bad, thanks to a bunch of amateurs! You know, many of the GCNA contingent have never seen it. (I have only seen very old photographs of it.) It would be nice to post some pictures of it here. You can put those right in the text by inserting the URL to a web location of a photo. (Use the Img button above.) Antwerp also goes off every 7.5 minutes, of course. That's not as large a drum, correct?